Winter into Spring can put some couples off planning a wedding as they worry about the weather and it got us thinking about a wedding we planned on a beautiful day in February. 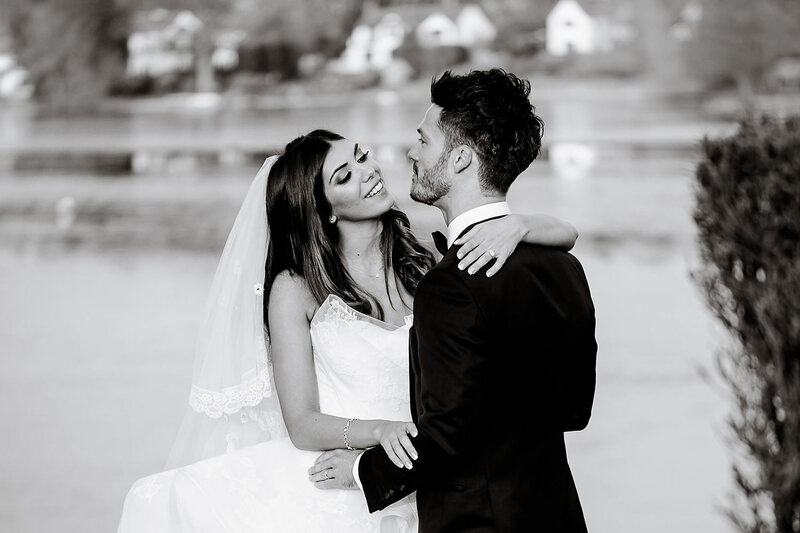 Leila and Charlie chose for their special day The Mere Golf Resort and Spa in Cheshire and it was a glorious Saturday and one that none of us will forget! Right from the off we knew that it was going to go smoothly. Our expert venue dressing team arrived the night before to set up the marquee draping in the room that would be a key feature in the wedding. The visionary florist, Mat at Red Floral Architecture, then took care to create a real old Hollywood glamour-feel to the ceremony room with plinths holding huge floral arrangements lining the aisle and glass vases with candles in them meandering through. The arrangements for the ceremony were to be a complete surprise to Leila and she was truly wowed when she saw them! The ceremony touched everyone’s hearts with Leila walking down the aisle to the classic Pachelbel’s Canon in D played by a string quartet in her Vera Wang dress. I’m not the most sentimental soul but even I had a lump in my throat! The emotion and beauty of it all was expertly captured by the photographer Phil Drinkwater and videographer Tom Harrington. Into the lobby for the drinks reception and the close-up magician Ian Lavin surprised and entertained the guests with his magic tricks. The string quartet changed to a more upbeat, playlist to liven up the room. A quick turnaround during the drinks reception and the room was ready for the wedding breakfast. Every detail from the gorgeous floral arrangements to the classic stationery by Soko studio was in keeping with the theme and really pulled together. The food provided by the Mere was also top notch. The speeches were full of big laughs, tear jerking anecdotes and the best men even had a video! Another quick turnaround for the evening and the room was ready to party. Our venue dressing team used purple uplighters to give the room a magical glow. Over to the stunning five tier cake made by Marise at Bloomsbury cakes which was so beautifully decorated, they didn’t want to cut it! By the dancefloor, the 4ft LOVE sign stood behind the stage ready for the first dance. The song choice was vintage, upbeat and personal. After that the party went on with Dominic Halpin and The HoneyB’s getting everyone on their feet. To add to the entertainment, we had Boothtique set up a photobooth and Ferrero Rocher heart which made for a really fun atmosphere. Instead of formal evening food, the couple opted for a team of crepe chefs to serve up some fresh sweet and savoury crepes which was very popular with the guests (and the suppliers!). The night ended with a bang as everyone was given some warming mulled cider and wine to brave the cold for the fireworks display. A great way to end the night as the DJ played on. Leila and Charlie’s wedding was beautiful through and through. It was a privilege and a pleasure to be involved in their special day and we couldn’t have asked for lovelier people to work with!